Sizes Available: Small - 16" Large - 24"
This is a made to order item. Please allow 4 - 6 weeks production prior to shipment. July 04, 2016 by Kathleen D.
The website states that this item is designed by a husband and wife team in Georgia; however, one reviewer reported that hers came with a "Made in the Philippines" sticker attached. I spoke with a customer service representative through online chat specifically to ask about this discrepancy. Also, I was concerned that this custom-made item could not be returned. I was assured that although the WOOD PIECES came from the Philippines, the item itself was "made beautifully in Georgia by a wonderful husband and wife team". So, I went ahead and ordered the item. It is very nicely made, rather heavy with nicely placed wood pieces, similar to the photo. But...there was, indeed, a 1" square sticker on the back of the heart that said "Made in the Philippines". The sticker was not on a single piece of wood, but spanned two adjoining pieces and was lightly adhered. There is NO POSSIBLE WAY the sticker had been applied pre-production or could have remained adhered after the piece was made. I feel deceived. The item is nice, but it is misrepresented. Customer Service was apologetic when I called again to express my dismay. This time, the representative stated that while the heart was designed in Georgia by the husband-wife team, it is actually made in the Philippines. I wish they would have originally been upfront about that. If you are looking for a Made in US item, this is not for you. If you don't mind the discrepancies, you'll probably like this piece. It comes with hardware attached so it is easy to hang. Mine wobbles a bit from side to side because the back is not completely flat. Overall, it's a nice piece. I would have preferred less back story! December 13, 2015 by Tara C.
Yes, I love my new piece however I was a little disappointed b/c I bought the whole "designed in Georgia" as described only for my piece to come with a huge "MADE IN THE PHILIPPINES" sticker staring at me as soon as I opened the box. At least take the time to remove that before y'all mail out next time? I had to wait months for this to become available and I love it in my home. When my daughter moved into her new home I sent her one as a gift. Such a great look. She's in Boston and loves the beachy feel. 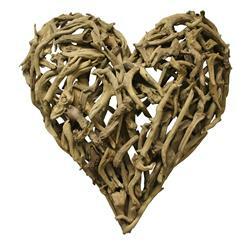 Designed by a husband and wife team, our driftwood hearts are inspired by the ones we love. Motifs come from family, nature, animals, old things, children's art and folk art. All driftwood hearts are designed with love in the Blue Ridge Mountains of North Georgia.